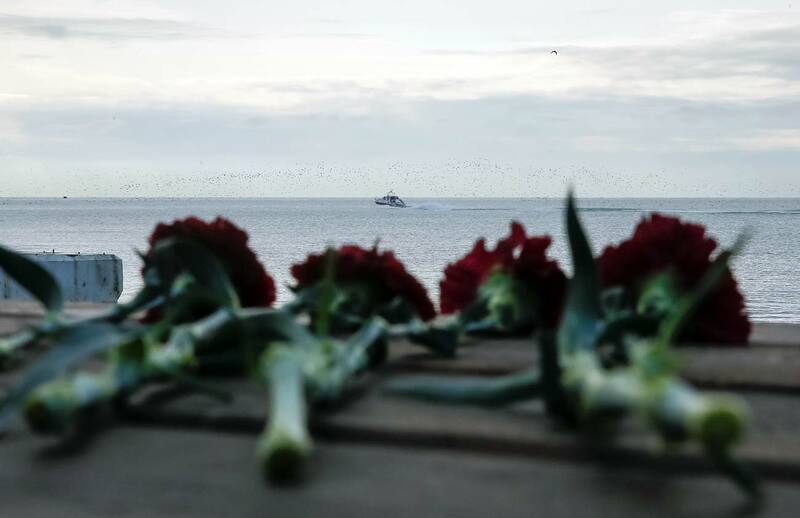 Flowers are placed on a pier as a boat of Russian Emergencies Ministry sails near the crash site of a Russian military Tu-154 plane, which crashed into the Black Sea on its way to Syria on Sunday, in the Black Sea resort city of Sochi. An act of terror is not seen as the main version of the Tu-154 crash in Sochi, Russian Transport Minister, Maxim Sokolov, who leads the government commission probing into the crash, said on Dec. 26. "Today, as far as we know, the major versions do not include the terrorist attack, so we assume that the cause of the crash could be either technical malfunction or pilot error. I will emphasize, however, that this will be established by investigators as well as special technical commission of the Russian Defense Ministry," Sokolov told a press briefing after a meeting of the commission to investigate the disaster broadcast live by the Russia 24 TV channel. The Russian Defense Ministry’s Tu-154 plane disappeared from radar screens at 05.40 am Moscow time (02.40 a.m. GMT) shortly after taking off from the Black Sea resort of Sochi on Dec. 25. There were 92 people on board the aircraft, including eight crew members. Among the passengers was the Executive Director of the Spravedlivaya Pomoshch (Fair Aid) charity fund, Elizaveta Glinka, better known to the Russian public as Dr. Liza, as well as military servicemen and nine reporters from Russia's Channel One, Zvezda and NTV networks.The plane was also carrying members of the famous Alexandrov Ensemble, an official army choir of the Russian Armed Forces. The ensemble was on its way to celebrate the New Year with the group of Russia’s Aerospace Forces at the Hmeymim air base in Syria.